By buying this product you can collect up to 3697 bonuspoints. Ånglok med tender klass 18 505 typ LVA Minden, loket har dcc digitaldekoder, ljudmodul, längd över buffertar 142 mm, epok III. The locomotive is a tooling variation (examples: sound dampers for the Riggenbach counter-pressure brake, air intake valves). The locomotive and tender are constructed of die-cast metal. The locomotive has a motor with a bell-shaped armature and a flywheel, mounted in the boiler. It also has a built-in digital decoder and sound generator with the formats DCC, Selectrix, and Selectrix 2. The locomotive and tender are close coupled. 3 axles powered through side rods. Traction tires. Triple headlights consisting of warm white LEDs. Length over the buffers 142 mm / 5-5/8'. 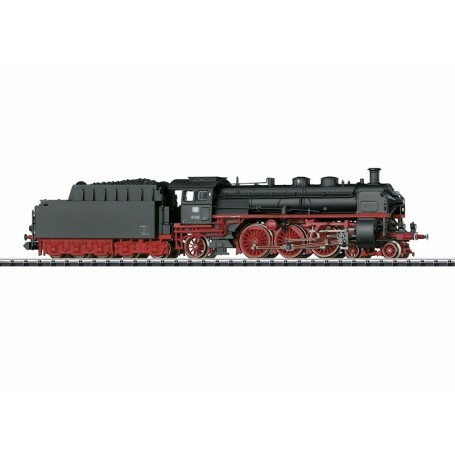 A passenger train to go with this locomotive is available under item number 15680.